When a successful team comes together, expectations obviously rises high. SO is the case with 7 Am Arivu. Suriya, director A R Murugadoss and music composer Harris Jayaraj team up again after the blockbuster Ghajini, obviously all eyes are on the movie. Ilaya Thalapathi Vijay has his comfort zone in the form of formula mass films that have a superhero at its epi-centre, destroying evil; saving his world; offering safety and security to those around him: all preferably done with panache and the prowess of a superman. 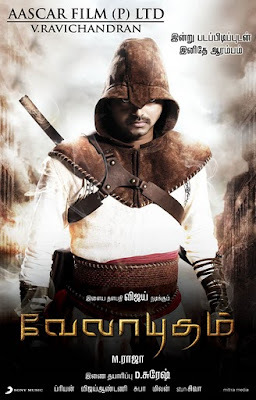 This time too, he has attempted more of the same with Aascar Ravichandran's Velayudham, directed by M Raja. It is safe to say that the young commander has managed to hit the bull's eye. Velayudham, remade from the Telugu hit Azad, with suitable modifications, has a story that's as old as the hills but there are a few elements that do add some flavour to the old wine in a new bottle. Bharathi (Genalia) is a journalist on a mission. She fights against evil and corrupt men in the society. She reports on Home Minister's links with ultras and their plans to disturb peace in Tamilnadu by planting bombs. She incurs their wrath and she becomes their target. Meanwhile she leaves a note where she creates an artificial character Velyudham, whom she says will end the menace of corrupt and greedy. Interestingly there is one Velayudham (Vijay), a milkman in a village living a happy life with his sister (Saranya Mohan). Videhi (Hanshika Motwani) has a crush on him. She is his cousin in the village and the rural belle is desperately in love with Velayudham. One day velayudham comes to Chenani to withdraw cash from a chit fund firm and he comes across Bharathi. It is now obvious that Velayudham will take up the challenge and he turns the messiah of the masses from here. Its action and revenge from here. It's Vijay special all the way. Three cheers to Raja for weaving a script to the strength of Vijay. His mass elements are utilised well; by the director. As usual Vijay rocks in dance and stunt sequences. Interestingly in the climax, he rips his shirt and fights, a delight for his fans. Genelia is apt fort the role. She plays a serious journalist and has a meaty role to do. Hanshika provides the oomph factor. As rural belle, she is impressive. She does her role well. She tries her hand at comedy too. Three cheers to her. Saranya Mohan has a part to play while Sanathanam as usual flies high with his one-liners, that are rib-tickling. Vijay and Raja team up to give an unpretentious entertainer. It is a good movie to see relish and enjoy. Vijay at his best, it has everything to appease movie -buffs. But the lacunae is its length. Specially needless songs stuffed in between which breaks the flow.